WASHINGTON (THURSDAY, MAY 31, 2018) – More than a dozen regional and national immigrant rights organizations will protest at 11 a.m. Friday in front of the Department of Justice to denounce the Trump administration’s shockingly brutal and cruel treatment of immigrant families at the border and throughout the country as part of its racist agenda. The allies strongly condemn the separation of children from their parents, a cruel and illegal policy implemented earlier this month which goes against every international law aimed at protecting children. The groups are calling for Attorney General Jeff Sessions to immediately rescind this practice, which is sending children as young as two to shelters throughout the southwest without their parents. The shelters are now at 95 percent capacity and, to make matters worse, the Administration has even considered housing these children on military bases. Defenders of immigrant rights are also appalled at the brutality perpetrated on immigrants who travel to the United States looking for a better future, as in the case of the murder of Claudia Patricia Gomez Gonzalez, whose life was ruthlessly taken away by a Border Patrol agent in Rio Bravo, Texas, last week. The groups will demand an unbiased investigation into why an unarmed 19-year-old woman was shot in the head. Activists also want answers as to why Roxsana Hernandez, a transgender woman, who was part of the much-publicized caravan of immigrants that reached the border last month, died while in ICE custody. She came from Honduras, a country with a pattern of killing and terrorizing LGBTQ individuals, and was seeking asylum. Protesters St. NW to represent immigrants who have died as a result of Trump’s racist policies. WHY: To demand Attorney General Sessions rescind the policy of separating parents from children at the border. 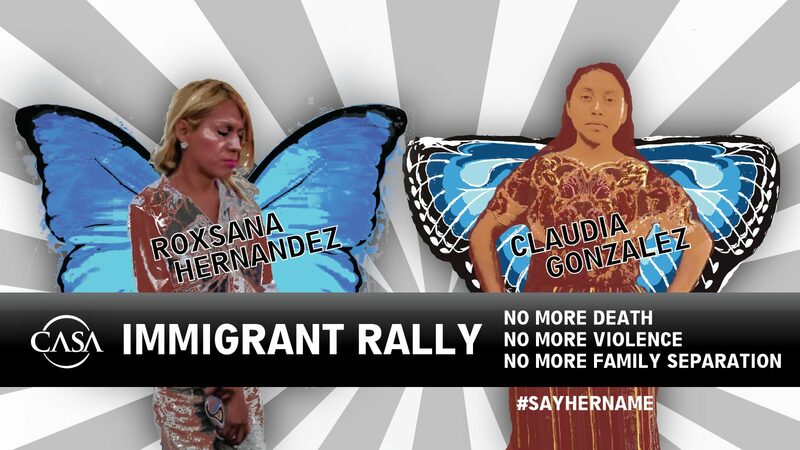 Call for justice for Claudia Patricia Gomez Gonzalez, a 19-year-old undocumented woman who was murdered by a Border Patrol agent, and Roxsana Hernandez, a transgender woman who died while in ICE custody.